It is impossible to think of a more sympathetic pianist than Leon McCawley. The Sonata is Barber’s masterpiece, and McCawley is brilliant, giving it a committed performance, especially in the torrential fugue. This is an excellent collection of Barber’s piano music. It is performed with devotion and technical brilliance while remaining emotionally faithful. This disc shows different facets of Barber’s legacy and depicts him in a portrait that is both personal and very humane. Leon McCawley’s reading of Barber’s solo piano works is a superb collection, admirably and intelligently delivered. It’s a measure of the international standing of Barber that, a year after his centenary, a British pianist has come up with an outstanding release, and against plenty of competition. Pianists line up to play Barber’s demanding Sonata, possibly because it was written for the legendary Horowitz, much as actors clamour to play Hamlet. McCawley takes the first movement slower that some pianists but he makes its points intelligently rather than resorting to a kind of non-stop pyrotechnical display. The Scherzo sparkles; the Adagio is impeccably paced through its anguished climax; and McCawley makes light of the difficulties in the final fugue as its catchy subject is put through its manic paces. Souvenirs, with its light-hearted glances at various popular idioms, is a sheer delight, and so are the four Excursions dipping into jazz/blues/country in Barber’s own way. Less well known are the Three Sketches written in Barber’s teens and the Two Interludes. These stem from late Brahms but McCawley makes a convincing case for both of them. Then there’s the Nocturne (Homage to John Field) and the late Ballade, its opening common chords apparently expressing tranquillity but reflecting the isolation of Barber’s sad final years in its dramatic central section. McCawley delivers everything magnificently. This is now the CD to get of Barber’s piano music. 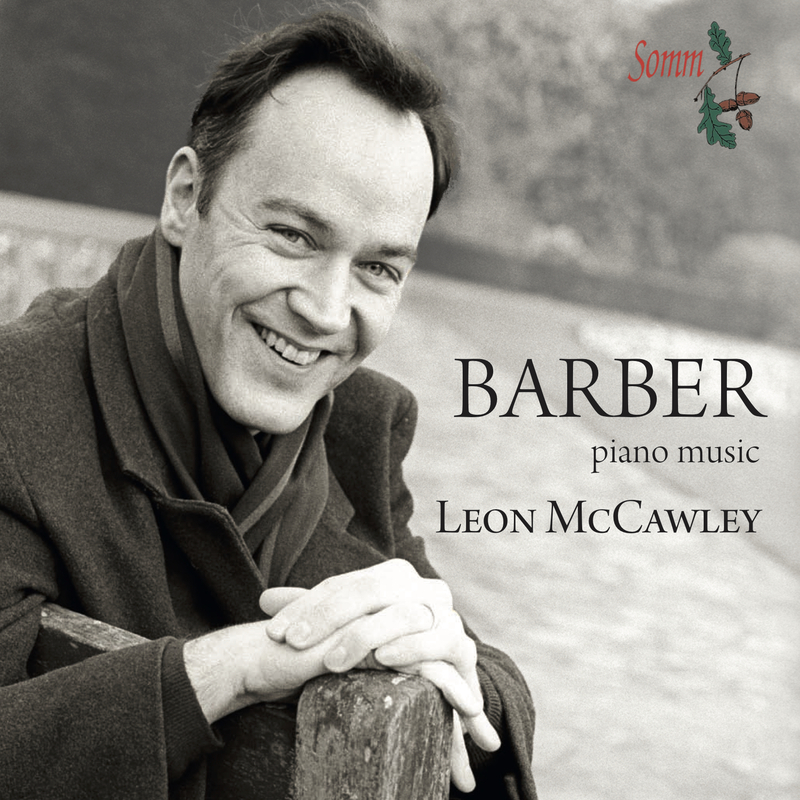 Leon McCawley recorded Barber’s piano music for Virgin Classics in 1997; he revisits the repertoire here and brings to it a feeling of fresh discovery. There is much competition in the Sonata from John Browning, Horowitz and Cliburn, yet McCawley holds his head high. McCawley makes Busoni’s influence felt more than in any other performance I have heard. The Scherzo becomes a sort of maleficent Mendelssohn, while a bare Adagio mesto is like some Robert Frost nature evocation. Throughout, McCawley has the variety of touch and musical intellect necessary to evoke Barber’s myriad moods- traits heard nowhere better than in the Excursions. The musical audacity of the Souvenirs is realised just as accurately as the desolation of the late Ballade. McCawley dispatches this [Barber’s Sonata Op. 26] with phenomenal clarity and accuracy and a powerful sense of line, attributes that he demonstrates in the second of the Interludes. He is no less impressive in the light-hearted numbers, the Souvenirs and the Excursions, or in the poetic and nostalgic works such as the Nocturne Op. 33, or the late Ballade, Op. 46. With the inclusion of a further 15 minutes of Barber’s piano works McCawley’s must now be the survey of choice, and the Somm engineers have perfectly captured all the clarity and warmth of tone that McCawley conjures from his Steinway. This is a lovely release encompassing much of the solo piano music of Samuel Barber, an American composer still under-rated this side of the pond — but then, aren’t they all, apart from Leonard Bernstein? Leon McCawley has long been a persuasive advocate of his music, and Birmingham audiences will remember a recital from him featuring Barber’s music in the Town Hall not so long ago. Here this most thoughtful of British pianists brings loving concern over detail to the early Three Sketches, as much as he does to the substantial Sonata of Barber’s mature years. Francis Poulenc, no less, was a great admirer of the Sonata, and by some kind of spooky osmosis, the spirit of that adorable French composer seems to hover behind Barber’s witty Souvenirs of 1950. There is much else to treasure here besides. Leon McCawley’s new disc reveals a spectrum of Barber’s terms of reference, be it Brahms in the two Interludes of 1929-31, modelled on Brahms’s intermezzos from the point of view of texture and atmosphere, or the second piece from Excursions (Op. 20) of 1944, entitled ‘In Slow Blues Tempo’ and using Debussy’s Clair de lune as a catalyst for a sultry study of Barber’s own. A Nocturne (1959), written in homage to John Field, starts in limpid, lyrical, early 19th-century style but with tweaks to the implied harmony in the right hand that shift it into Barber’s own time. This is diverting and attractively written material. The Op. 28 Souvenirs of 1950, conceived, according to Barber, with “amused tenderness,” look back to a carefree palm court just before the First World War. Ghosts of Ravel (in the opening ‘Waltz’) and Satie (in the ‘Pas de deux’) combine with shades of some of the jokier members of the early 20th-century Parisian artistic cliques to hover over the music, adding to the impression of artful magpie tendencies in Barber’s piano music. But McCawley’s playing is of such distinction and skilful characterization that he pertinently brings it to life. The Ballade, Op. 46, written for the Van Cliburn Competition in 1977, is a far more poignant, personal piece, as indeed is the Piano Sonata of 1947-49, mixing acerbity, drive, cunning counterpoint and technically taxing, scintillating bravura. McCawley’s powerful account [of Barber’s Sonata] reminds one agreeably of the argument’s sinew and scope, the structure with its driven first movement, incisive scherzo, melancholy adagio and dazzling fugal finale.